1. Spend on Classics, don’t waste money on fads. The good news this season is that the trendier items are still considered classics, such as pretty sheath and wrap dresses, year-round tropical weight fabrics, tops that can double as jackets, and classic blazers. Think about versatility and being able to wear pieces in more than one situation. 2. 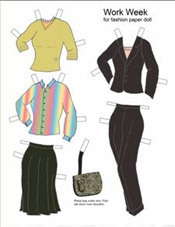 Purchasing and dressing in capsules, groups of clothing that can be worn together in various combinations, saves money in several ways: you can buy fewer pieces yet still have more outfits; the same accessories will match with all or most of the outfits in the group; and it is great for travel and can save room in your suitcase. P.S. If you don’t like the idea of buying clothing in coordinating grou ps, at least make sure that what you do buy matches at least three other items in your wardrobe. Otherwise you will end up with that famous full closet and nothing to wear. 3. I wish I could tell you that the major department stores will have huge sales at the end of the season at which you can stock up on your favorite spring and summer styles; unfortunately you will see fewer sales at department stores as they have considerably lowered inventory since they don’t want to be stuck with a lot of leftovers at the end of the season. The best bets for discounts are outlet stores like those at Woodbury Commons and Secaucus. 4. In any case, if you are looking to save money, stay out of the shoe and pocketbook departments, shoe designers seem to want overcompensate for the seriousness of some of the clothing styles and pocketbook prices have hit the roof. Accessories which you might want to concentrate on though are ties, belts and scarves; they are a good way to update outfits. Belts can be worn either in the loops on pants or just slung over a dress or jacket. The right accessories add polish to any outfit and can make your wardrobe look fresh. 5. Make regular visits to the shoemaker, tailor and dry cleaner, they will help extend the life of the clothes that you’ve invested in. You don’t want to dry clean your clothing too much however, the fabric will become shiny; sometimes all you need is a professional pressing which will both save the life of your clothing and the rate at which you spend your money.